E. RENAULT -Paris - Foulard Renault, Guide dans Paris / Renault's illustrated Paris Guide. E. RENAULT - Paris - Foulard Renault, Guide dans Paris / Renault's illustrated Paris Guide. Title : Paris - Foulard Renault, Guide dans Paris / Renault's illustrated Paris Guide..
Map maker : E. RENAULT. Date : Rouen, ca. 1860. Size : 27.6 x 30.7 inches. / 70.0 x 78.0 cm. 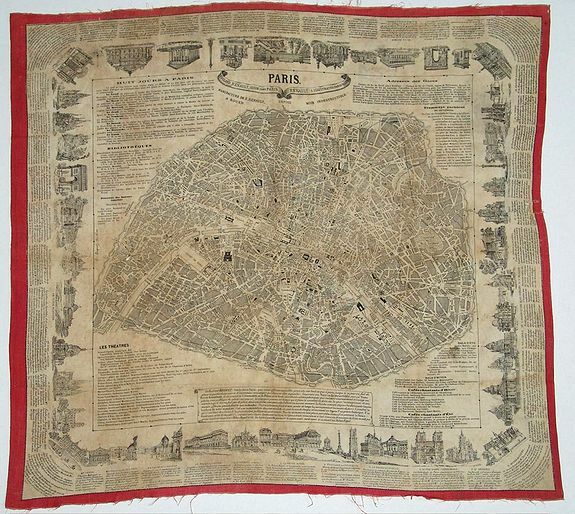 Description :Plan of Paris printed on textile. Surrounded with text and numerous vignettes. Condition : Stained, repaired tear in right part.